As a key determinant of drug pharmacokinetics, transporter mediated drug-drug interaction has garnered significant attention from the pharmaceutical industry and regulatory authorities. Corning offers a comprehensive list of tools to support drug transporter studies and recently introduced Corning® TransportoCells™ products to support in vitro assessment of drug interaction with SLC transporters. This new model provides a convenient “thaw and go” cell-based model with robust activity and consistent performance. 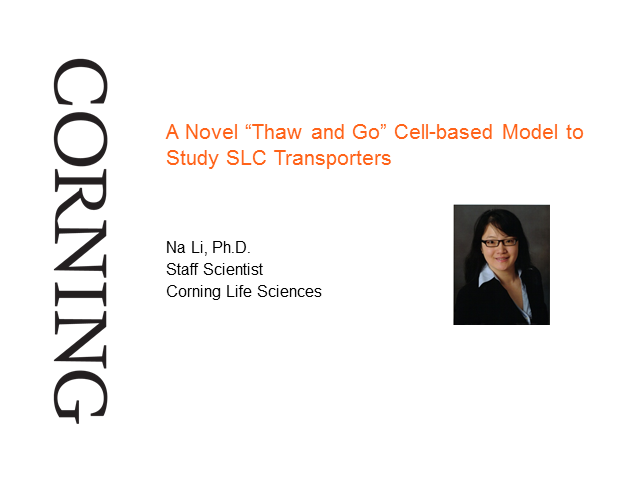 In this webinar, we will provide an overview of Corning TransportoCells products along with applications for in vitro-to-in vivo correlation. Validation data will also be presented for the newly available TransportoCells products, including OATP1A2, OATP2B1, PEPT1, PEPT2, and NTCP. Dr. Na Li received her B.S degree in Biology from Fudan University, Shanghai, China, and her Ph.D. in Pharmacology from Dartmouth Medical School, Hanover, NH. Her major research focus is on drug transporters, including interspecies differences in hepatobiliary transporters, transporter quantification, and in vitro-to-in vivo extrapolation of drug pharmacokinetics. At Corning, Dr. Li contributes her expertise in in vitro drug transporter technology and its application in drug ADME. Presented by: Na Li, Ph.D.